A new electronic flagging system for sepsis has been launched at Wales’ largest Emergency Unit to improve patient care. The ‘Sepsis Star’ complements the existing sepsis screening tool which is already in place at Cardiff and Vale University Health Board, and is applied when a patient screens positive for red flag sepsis. The star will alert clinical staff when a patient has screened positive for sepsis and requires Sepsis Six treatment. Sepsis Six treatment must be delivered within one hour of a positive sepsis screen to ensure the patient has the best chance of recovery. 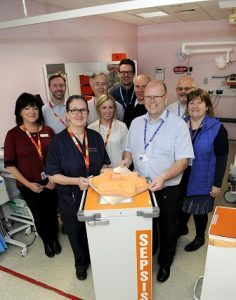 A team from the health board worked together over the past six months to develop the new system for the Emergency Unit workstation and Clinical Ward Workstation at University Hospital of Wales (UHW), to improve the way sepsis is recognised and treated. The team included Paul Bowen – Developer IMT, Laura Potts – Clinical Leadership Training Fellow, Dr Paul Morgan – Consultant Intensivist and Sepsis Lead, Gemma Ellis – Consultant Nurse and Lead for Sepsis, and Dr Sue Allen – Consultant in Emergency Medicine and Tracey Shanahan – Senior Nurse and Sepsis Leads for the Emergency Unit. The flagging tool was developed alongside an e-learning module, designed by Peter Noneley, to provide essential training to clinical staff in the use of the Sepsis Star and its benefits. The new flagging system was designed to be as simple and quick as possible, so it does not add to the workload of busy unscheduled care staff but helps patients receive the Sepsis Six care and treatment required in a timely manner. Sepsis is a potentially life-threatening condition, where the body attacks its own organs and tissues as a reaction to an infection. At least 260,000 people a year in the UK suffer from serious sepsis which can cause death or multiple limb amputations. However sepsis can be easily treated if caught early, with earlier identification and treatment across the UK estimated to save around 14,000 lives. Any patient who is brought to the Emergency Unit or Assessment Unit at UHW and screens positive for sepsis will now be entered onto the electronic system. This will then start the clock to give a timescale to complete the Sepsis Six within one hour. Once all the necessary treatments are completed, the Sepsis Star will turn blue to confirm the patient has received the treatment required. If, however, more than an hour has passed since sepsis was identified and the treatment is incomplete, the Sepsis Star will turn red to flag to a clinician that quick action needs to be taken. The Sepsis Star will also follow the patient in their hospital journey so ward staff can access the information during a ward admission. Laura Potts, Clinical Leadership Training Fellow said: “The primary use of the Sepsis Star is to alert staff that a patient has sepsis and create a clear record of what treatment they have received. The star will also enable data about the incidence of sepsis and compliance with Sepsis Six treatment to be collected easily. The Sepsis Star tool has been launched at UHW and will shortly be rolled out across the health board so all acute admission patients will be effectively screened, enabling 24/7 data collection.